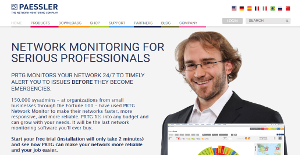 Paessler AG’s PTRG Network Monitor is a network infrastructure monitoring solution that acts proactively to inform users about any glitches in the networking before that error creates big problems for their businesses. Individuals, smalls groups, medium-sized companies, and large companies alike can monitor all their network components with PRTG. PRTG monitoring covers all the network devices such as switches, routers, access points and servers. Along with the devices, PRTG looks over the networking infrastructure as well that includes servers, storage, workstations, and software applications and services. Finally, PRTG comes as an all inclusive package to cover most of the network monitoring regimes with simplicity and efficiency. Paessler’s PRTG Network Monitor is ideal for companies of all sizes, be it a single workstation or a company of thousands of systems. PRTG works to maximize the networks’ uptime and inform the administration about any problems in the network that can eventually put it down. What makes PRTG stand out from the rest of the network monitors is its unique remote probe technology. With this technology, businesses, internet service providers, data center providers, and MSPs can examine their network from inside out from a remote location. The remote probe technology gives complete visibility into the network’s functioning. This allows the service providers and users to prevent network failures before they occur. Another distinctive feature of PRTG is its hierarchical device view that allows the network administrators to diagnose the problems at the device level and fix them without much fuss. Moreover, the network administrators can generate QR codes for each device and paste them with the hardware for quick recognition. This saves a lot of time in network diagnostics when a problem occurs as sometimes the solution identifies a problematic device yet the technical team finds it difficult to sort it out among thousands of similar devices at the same place. PRTG also has a mobile app for quick reporting of the errors. The intuitive reporting features of PRTG are the prime reasons why hundreds of thousands of network administrators trust this solution for their network management needs. There are well-liked and widely used systems in each software category. But are they essentially the best fit for your organization’s specific wants? A popular software solution may have thousands of users, but does it offer what you require? For this reason, do not blindly shell out for popular systems. Read at least a few Paessler reviews and consider the elements that you desire in the software such as the cost, main functionality, available integrations etc. Then, select a few apps that fit your needs. Try out the free trials of these products, read online reviews, get clarifications from the vendor, and do your investigation meticulously. This in-depth groundwork is sure to assist you select the most excellent software application for your organization’s unique needs. How Much Does Paessler Cost? We realize that when you make a decision to buy IT Management Software it’s important not only to see how experts evaluate it in their reviews, but also to find out if the real people and companies that buy it are actually satisfied with the product. That’s why we’ve created our behavior-based Customer Satisfaction Algorithm™ that gathers customer reviews, comments and Paessler reviews across a wide range of social media sites. The data is then presented in an easy to digest form showing how many people had positive and negative experience with Paessler. With that information at hand you should be equipped to make an informed buying decision that you won’t regret. What are Paessler pricing details? What integrations are available for Paessler? If you need more information about Paessler or you simply have a question let us know what you need and we’ll forward your request directly to the vendor.